For more than sixty years Friendship schools meet the education needs and were the heart of the Friendship community. In 1899, soon after old Greer County was declared to be a part of Oklahoma Territory and opened for homesteading. Clabber Flat school and after was called Friendship by some of those the school was the original home of the Friendship Baptist Church. Clabber Flat (Friendship School District) consolidated with Navajoe and part of Lone Oak and Riverside school districts. A new school was built to serve the new consolidated district it was called Friendship. In 1937 the last Friendship school was built as a WPA project. In 1947 a part of the Ozark District and later in 1958, the Headrick District joined the Frienship school District. On Novemeber 1, 1962, the Friendship School burned and the school year was completed in the abandoned Humphreys School building. In August 1963, Friendship consolidated with Warren School District and formed the school now known as Navajoe School. 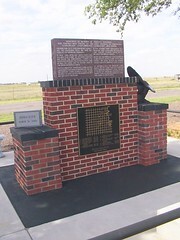 East of Altus, Ok, Highway 62 turn north at mile marker 45, go to the town of Friendship, from the Friendship/Western Cattle Trail Marker continue on North 1 mile, 1/2 mile West, monument on the south side of road. Friendship was once called Alfalfa, serving as the site of the Alfalfa Post Office from 1930 to 1905. 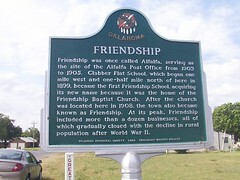 Clabber Flat School, which began one mile west and one-half mile north of here in 1899, became the first Friendship School, acquiring its new name because it was the home of the Friendship Baptist Church. After the church was located here in 1908, the town also became known as Friendship. At its peak, Friendship included more than a dozen businesses, all of which gradually closed with the decline in rural population after World War II. 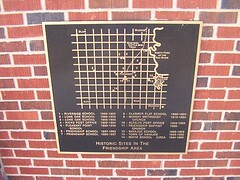 Oklahoma Historical Society 2003 - Friendship History Project.